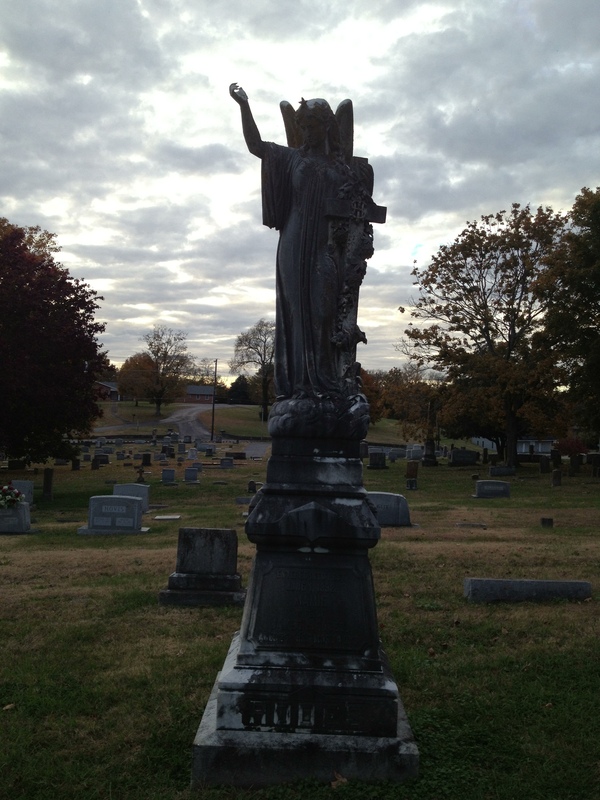 Graveyards, Tombstones…the speck of infinity wherein time has stopped. Here one is able to notice an era of foregone lives and remembrance that is now only marked by stones that are too large to move and to irrelevant to demand attention. Some stones have been pushed over, some broken in half; others have crumbled from the weight of patience and are slowly deteriorating one speck of dust at a time. To use a reference from Catcher and the Rye, many even have red crayons on them…tribute of the one who chose to vandalize rather than respect the place where history was completed. Whatever the cause, plight or age, these weathered stones and sunken grounds populate the landscapes of historic cemeteries and ancient church yards. They reside on hillsides long forgotten or beside sanctuary’s that no longer include them in worship. There are very few well worn walkways. Few hillsides with the ghost of Christmas present perceptibly known. Gothic rod iron fences that envelope family plots now with missing gates…visible signs that not only can no one be kept out, but no one wants in. The only sign of history is this stone; an anchor in time that refuses to let the yore swallow us whole without some scar on the earth. Some stones are traditional, rectangular monuments that set upon the ground over top the breath now stolen from distant lungs. They have rounded tops that slant down like a bell curve with a simple name, dates and perhaps a mention of their prodigy. Usually one finds a monument with two names, one for each spouse, lives bound by time and not prevented to rest beside one another for eternity…the only thing connecting them…the shingling of their dates. Other stones are more alluring and rousing, stones that are large obelisks that protrude from out of the ground. These stones have triangular tops that point to the heavens, as if to direct the souls beneath them the direction of their flight. They are perfectly square all around with large bases that are able to withstand the very best of Mother Nature, though upon seeing some of them worn it is clear who will eventually win this contest. Others tombstones, from an age in which honor was bestowed upon the dead recognizing that they are the ones that shaped our present, are tall rounded projectiles wherein cloaks and tassels are carved out of the stone and draped over the marker. It a sense of humanity wrapped in granite, importance signified by the perpetual wave of nothingness that is their life in the present memory of those who stand before them. There is a distinctly eerie feeling associated with these stones, these inelastic monoliths that take on a lifelike portraiture of cloaking the one who no longer needs this cloak or these tassels…or the warmth of these cool reminders in time. Who cares so much about their dead that they give such minute attention to the very stone that will serve no purpose but to rebuke time and demand this life be remembered? And still others, have pictures of the deceased, old photographs that capture our senses and haunt our memory as we peer into a glimpse of one that is no longer with us; the Aryan blue eyes and blonde hair of an extinguished light that now imperceptibly stares at us through the stone. We are our images…the stones simply remind us that beneath them is a picture we will never see…and it lies beneath the dates that are now etched into dense constitution of a stone that will one day be a testament to our world once our world and its people are gone. On one I read, “Baby,” with statue of a stone lamb lying atop the memorial. A reminder of a life dreams never had and families whose dreams have ended. On another I read, “Rector,” and I think about the sermons this man preached, the souls with whom he prayed. Now, he lies lonely…several yards away from the closest tomb and far from the prayers he most likely deserves on All Souls Day. Surprisingly, I notice another, “Blessed are they that die young…” and at once I am saddened by this child erased from the timeline of history, but relieved of the hurt and pain of living in the world. And then there are the stones, the markers, usually groups of them together in the oldest part of the cemetery that are nothing more than obscene fragments jutting from the ground. They are raw deposits of raw jagged rock, raw markers of raw lives, whose very marking in raw and unsanctified stone is representative of lives buried beneath. They remember those that lived for those that were actually living. Their tombs are sealed by the rock that says nothing and looks as if it was torn from the side of the cliff and then driven into the ground. I’ve walked up along these stones, ran my hand over their rough surface and asked the old man beside me, “who are these people?” and “When were they buried?” On occasion its neighboring stone has become so dilapidated and ruined…that I’ve picked up the pieces still intact and placed those back where they belong. There are many cemeteries filled with nothing but stones like this…testimonies of people who have been forgotten. 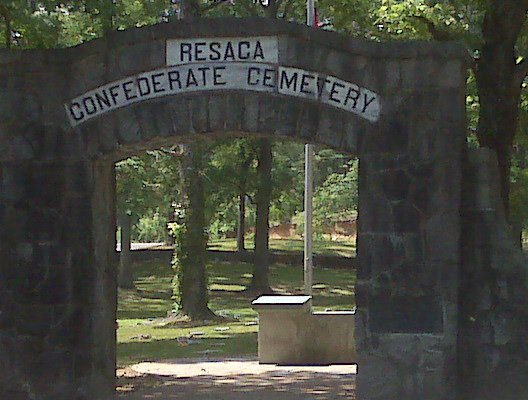 In Resaca, I walked in the penumbra of that Civil War battle where many are laid to rest. I walked hallowed ground as I stare at names of soldiers now sunken in the earth. I read the story of women who donated the land, buried the dead, and prayed for their families…I feel the heavy hearts that picked up shovels, opened the earth, and poured the bodies of dead young men into the ground as if watering the soil. Bright eyed optimism met fear and reserve on ground not far from here…racing pulses and sweaty brows climbed the hills that rise above this cemetery…an indentation of the world where the deposit of aspirations now lie in respite. The common denominator of these stones, their dwellings, is the telling of the stories that lay beneath them, over this ground, as this part of history closed its chapter and all its hopes, dreams, failure and accomplishments are buried beneath the unforgiving weight of the earth. These monuments are touching, emblematic of a connection in time to one that shaped the world in which we live, the very landscape that now holds them taking shape by feet they placed upon it. A lived experience that communities shared of dying young, growing old, and finding purpose…all as we live toward the direction of an earthen house that will mute our voices unless we are able to let a few of our dreams percolate to the surface. These stones, these grounds, are testimonies of stories that stopped being told. They are screaming reminders to not forget…to rehearse and retell of these people. The great irony is that these people are not much unlike us. We just find ourselves on a different part of the arch of history…and one day, our stones will scream too. Let’s tell our stories so our stones aren’t left with such a heavy burden all alone. Good stuff, brother. An excellent reflection!